If you're fond of the ubiquitous yellow mouse that is the iconic mascot of Pokemon, Nintendo is offering a special Pokewalker route all through April that will let you catch special Pikachu - and nothing but Pikachu. Before (and since) the launch of Pokemon HeartGold & SoulSilver here in the West, Nintendo has been heavily hyping up its Pokewalker accessory, a device that lets you train your Pokemon by walking, find items, and even catch new critters when you don't even have your DS with you! Naturally, given that fully unlocking the Pokewalker requires a journey the Proclaimers would have been proud of, the company has also released alternate routes to stroll down with your Pokemon that don't require such a commitment - for example, the Night Sky's Edge route that came with the rare Jirachi. 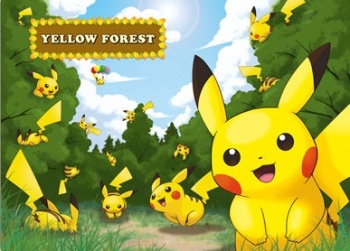 Now, Nintendo is letting Pokefans of all ages take a special walk through the Yellow Forest, a wooded route that contains everybody's favorite electric rat. Only available from April 1st to April 30th, the Yellow Forest will be available via the Nintendo Wi-Fi Connection, according to the official site. Download it, and stroll away with the Pikachu! The Yellow Forest will allow trainers to catch Pikachu that learn moves they ordinarily wouldn't, like male Pikachu that Surf and female Pikachu that... Fly? Okay, I get the Surfing thing, because it's been around the Pokemon world before. But Fly? How the hell does a Pikachu Fly you from Goldenrod City all the way to Olivine City? What, does it have a jetpack or something? ...hold on, I think I need to call Nintendo and tell them about an awesome idea I just had.